I have two regular readers who dont post in the comments much but who are encouraging me to be more active on here and I am really going to try. Annette and Paula thanks, it helps so much to know that there are people out there rooting for me, it has been a difficult 9 months and the winter weather, snow, cold and ice is not helping my frame of mind. Paula I have been thinking of you while watching the terrible weather all around us, we have been lucky to dodge the worst of it where we are so far. Keep safe and warm! Todays triptych is one I made up of Taxes who will be a 3 year old this January. I am not shooting much but I particularly loved this grouping, shows the life of a baby horse, eating, playing and sleeping. It is snowing outside, expecting a few inches, we have avoided most of the really bad storms so far this year, they have been east west south and north of us. Just had one light icestorm on Thursday and I ended up halfway down the embankment in one of my fields when trying to drive down our lane. The trees stopped me from going right down the bank, so I am very wary about driving in this weather. Todays picture was one that my late husband Larry digitally enhanced a year or so ago a few months before he passed away. 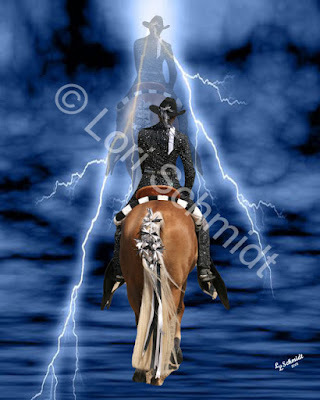 He made it from a picture I had shot at a Palomino show or one of the contestants in Parade Costume taken from the rear. It is a very emotional picture for me and brings back a heavy heart every time I view it. My walk to my mailbox at the end of our lane sometimes holds pleasant surprises for me as it is right next to a forested area and I sometimes over the years see a mother deer and her baby (I have seen her with her offspring right there in front of me not 25 feet away many times) and of course lots of squirrels. I saw the Doe and her fawn a few weeks ago for the first time in a long time but hunting season started shortly after that and I havent seen any sign of any deer since then until today when I saw just the baby and no momma by the railway tracks as I was crossing them to turn into our lane. 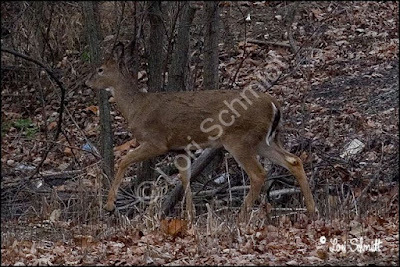 I can't help but think that momma has been a victim of the bow or gun season as this is the first time I have only seen one on its own and it was definitely a young one. It isnt enough that we have to endure seeing multitudes of dead deer on the sides of the roads and highways wherever you go, but the hunting seasons take their toll too and as riders we have to be careful during these times that we wear bright orange clothing so we are not mistaken for a deer and shot!!!!! To each his own but I would rather shoot these beautiful animals with my camera, but then everyone is entitled to their opinion I suppose. 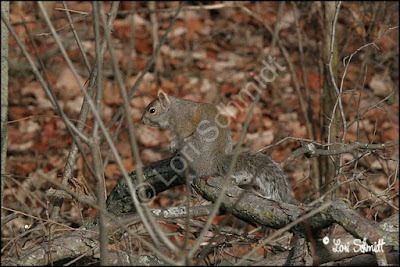 I also shot the second picture of the squirrel a few days ago. Oh and they have squirrel hunting season here too for those that dont know! Everything is regulated and supposed to be to keep the populations manageable, I still think we should control our own populations then maybe there will be room for all of God's creatures. Sorry venting, but I am an animal lover and that is how I see it. 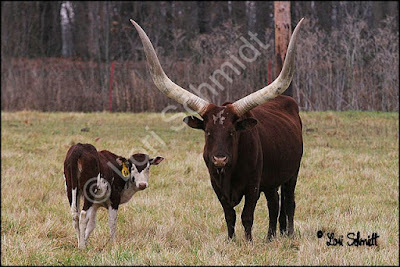 Todays pictures are of some cattle a few miles down the road. 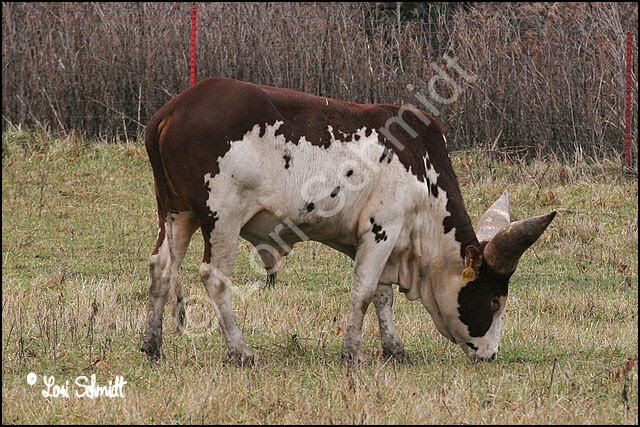 They have Longhorns and Watusi's (an African breed) and I am not sure if this one with the calf is a cross between the two or not, but the horns are sure impressive whichever way you look at them!